If you're looking for oily skin acne treatments, mind you that there are in fact two completely different yet complimentary approaches to effectively treat oily acne prone skin. There is the more famous external oily skin acne treatment that tackles the problem from the outside using exfoliation, cleansing, essential oils and blackhead removal methods, and there is the internal acne treatment that prevents the occurrence of oily skin in the first place. The best choice of course is to combine both the external and internal acne treatments for oily skin. In this way, one can tackle the already exiting problem from the outside while working to fix the internal environments that's causing the skin to become oily. Why do some people have oily skin while others don't? The answer lies in the over production of sebum (oil) by the oil glands. 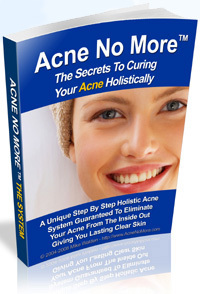 This is why we get more blackheads and shine in certain areas like the T-zone where there are more congested oil glands. The over production of sebum is triggered by hormonal irregularities. So what is the best external oily skin acne treatment? First, if you have oily skin and multiple blackheads, excessive scrubbing should be avoided and it is recommended to only use mild antibacterial soaps and cleansers. Harsh ingredients such as Benzoyl peroxide can irritate, damage and dry the skin, making your oil glands produce more oil to compensate. A TCA peel can temporarily change the skin pH and thus will help to get rid of excess oil. Accutane is a very strong prescription that can completely damage the oil glands, thus completely stopping sebum production. The problem is that in most cases this drastic oily skin acne treatment will be less effective as time goes by and the side effects can be quite severe. A very good external oily skin acne treatment I have personally found effective is Cypress oil, which promotes cellular regeneration and helps balance oily skin. But oily skin is caused manly due to internal imbalance and blackheads in particular are caused by over production of sebum along with blood toxins that find their way out through the skin. You can control and treat blackheads and oily skin externally using the above oily skin acne treatments along with tea tree oil a high quality bentonite mask, apple cider vinegar, aloe Vera and egg white masks. This will not remove all your blackheads, but it will minimize your pore size and help clear your pores of impurities that trigger blackheads. It will also accelerate the healing process of your skin. With that said, the only way to stop the extra oiliness and blackheads is to balance oil secretion internally and fix the internal cause that's causing the over production of sebum and the process whereby toxins find their way out through your skin and form blackheads. The only way to achieve that is the holistic way. By tackling the problem both externally and internally simultaneously, one can treat existing oily skin while stopping the cause from the inside (using specific cleansing, liver building, supplementation, dietary and lifestyle changes). This is the probably the most effective oily skin acne treatment.